Life A User’s Manual by Georges Perec (perhaps the greatest 20th century novel). Knuth may be an expert on sorting but ranking novels by their greatness is an invidious task. Perec’s masterpiece isn’t that well-known, in English-speaking countries at least, hence my surprise: few who have read the book would dispute the position claimed for it. The book visits the rooms of a Parisian apartment block, 11 Rue Simon-Crubellier, on June 23 1978, describing the inhabitants and their stories. There’s a fascination with detail and lists, with what exactly can be seen in each room, and I’ll admit this detail perplexed me the first time I read the book — what could be the significance of all of these things? On re-reading, I savour the details and the strange patterns they form. Early on, we look at the framed posters hanging on the wall of Madame de Beaumont’s drawing room. One of [the posters] depicts four greedy-looking monks sitting at a table around a Camembert cheese on the label of which four greedy-looking monks — the very same — are again at a table around, etc. The scene is repeated distinctly four times over. What a wonderful example of visual recursion! I’ve searched shelves and the internet for a good example of recursive product packaging, like the label on the Camembert cheese in the poster, but without much luck. I felt sure I’d seen some reflexive cereal boxes. Maybe this kind of visual pun has gone out of fashion? I did find some great cheese label collections assembled and put online by dedicated tyrosemiophiles. Here’s a greedy-looking monk. And here’s a donkey-riding monk holding out a Camembert cheese on the label of which you can just make out a donkey-riding monk, the very same. 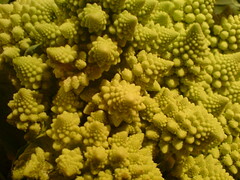 In the world of mathematics, fractals are self-similar shapes. However close you zoom in on them, they look the same. The recursive definition of the Sierpinski triangle is immediately obvious — it’s a triangle evenly divided into four Sierpinski triangles. What’s more remarkable is that the repeating landscapes found in the most famous fractal of them all are revealed by similarly simple mathematics. A coastline, for example, continues looks like a coastline as you zoom in on it. Here’s some self-similar broccoli. Point a webcam at a screen which monitors it, and you’ll see an obvious example of visual recursion. Virtualization software allows you to create a machine within a machine. A host operating system window can display within it a complete graphical user interface for a guest operating system. Would it be possible to take this a level deeper? Using Parallels Desktop on my OS X host, running Windows XP as a guest, I installed VMware Player virtualization software for Windows. Next I downloaded and started up vmTrac, a 113Mb VMware appliance which packages Trac, Subversion and Lighttpd on a FreeBSD core. The result appears below. 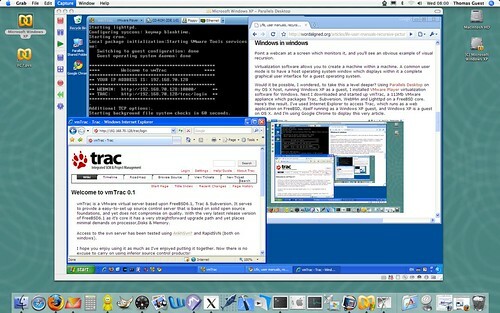 I’ve used Internet Explorer to access Trac, which runs as a web application on FreeBSD, itself running as a Windows XP guest, and Windows XP is a guest on OS X. And I’m using Google Chrome to display this very article. The fine art world enjoys a tradition of pictures within pictures. “Circle Limit II”, a woodcut from the online Escher picture gallery, depicts fishes whose scales are smaller fishes. Velázquez’s masterpiece, Las Meninas, may not be recursive, but it’s certainly self-referential. We can’t see the contents of the large canvas in the picture (unless you believe the mirror reflects a portion of it) but the artist working on it is Velázquez himself. A fictional painter, Serge Valene, the longest-standing inhabitant of 11 Rue Simon-Crubellier, narrates Life A User’s Manual. Actually, depicts would be a better word, for the book is conceived as a painting showing what would be seen if you removed the facade of the building and peered into each of the rooms. In the central chapter, 51, Valene imagines himself working on just such a painting. He would be standing beside his almost finished painting, and he would be precisely in the process of painting himself, sketching in with the tip of his brush the minute silhouette of a painter in a long grey smock and a violet scarf, with his palette in his hand, painting again the infinitesimal figurine of a painter painting, once again one of these nested reflections he would have wanted to pursue to infinite depths, as if his eyes and his hand had unlimited magnifying power. I don’t think it spoils the book to tell you he never completes this ambitious canvas. In fact he gets no further than drawing a few charcoal lines, the sketch of a cross-section of the building which no figure, now, will ever inhabit. This sketch appears as one of several appendices to the book, annotated with the names of who lived in each room, and when. It may not be finished but it does provide a key to one of the algorithms used to generate the book’s structure, and, stepping outside the fiction, the book itself is finished and complete. Via Word Aligned (via Knuth (via reddit)). Update: happily Stephan Schroevers did rather better. I should have searched for “Droste effect”, or even “mise en abyme”.